I hope you'll join me in my efforts to stop the abuse and neglect towards our truckers. Please PLEASE click on the above to find out how many of us are trying to give the trucking industry a better image. We're out here fighting for changes! We're tired of truck drivers' taking it in the "shorts". Find out how you can help. Let us know what we can do TO help! You'll be surprised at the changes already in effect! Truckers are found on highways, in truck stops, in service bays, on loading docks, on bush roads and at fuel stops, and often they are the first at the scene of an accident. Their wives help them. Little boys follow them. Relatives and friends don't understand them. Meals must wait for them. Weather can delay them. But nothing can stop them. A trucker is a paradox. He is a blue jeaned executive with his office in a cab. He is a scientist who hauls dangerous chemicals and explosives; a purchasing agent in a baseball cap; a personnel director with grease under his fingernails; a poor eater with a fondness for burgers and fries, steak and potatoes' a student of geography and a weather watcher who reads the clouds for rain or snow. He likes sunshine, children, smooth pavement, good traction, clean loads, dinner at home, weekends with his family, his shirt collar unbuttoned and country music. And there is a special place in his heart for his rig. He's not too fond of city traffic, tourist, or rotten drivers, fuel prices, dispatchers, snarly receivers, rubber neckers, kids in high powered cars or drunk drivers. Nobody else gets as much satisfaction out of talking about trucks, truckers, gear shifting, good weather, homemade pie, strong hot coffee, kids, wives, sweethearts and the price of diesel. He is your friend and your customer. He is your source of food, building products, clothing, petroleum, natural resources, in fact, nearly everything in your life arrived in his truck. And when he comes home after a long and tiring trip, the energy sapped from his hopes and dreams, he can be lifted up once more by a kiss from the wife and those magic words --- "Daddy's home."
. 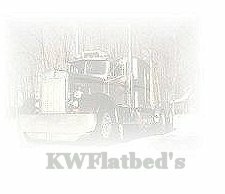 Copyright © 1998-2005 KWFLATBED, All rights reserved. without the prior consent of the writer.